Emy Bonifacio, Regional Director of PAMANA-OPAPP, leads coordination meeting with DPWH–SFDEO representatives and Task Force Commanders. 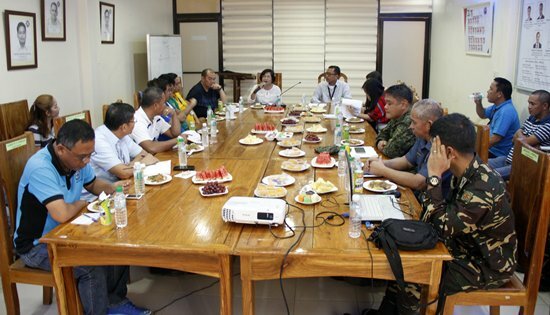 CALBAYOG CITY – The Department of Public Works and Highways for this year undertakes first coordination meeting with the PAMANA-OPAPP, held at Samar First District Engineering Office’s conference hall, San Policarpo, Calbayog City on August 3, 2017. The meeting is spearheaded by the Regional Director of PAMANA-OPAPP Emy Bonifacio together with the District Engineer Alvin A. Ignacio, City Planning Officials and Task Force Commanders. Payapa at Masaganang Pamayanan (PAMANA) is the national government’s convergence program that extends development interventions to isolated, hard-to-reach and conflict-affected communities, ensuring that they are not left behind. With a number of national line agencies as implementing partners, PAMANA remains as the government’s flagship program for conflict-vulnerable and –affected areas in the country – covering all existing developments and improvements. The goal of the meeting is to organize and get feedback from all the planning sectors of DPWH districts as well as local government units and gather information as to what would be beneficial for the area/s. Projects are proposed that are mostly roads that will interlink different municipalities, cities, and barangays. The vision of PAMANA is laying the foundation though policy reforms that establish the foundation of freedom from disorder, promotes the convergent delivery of services and goods focused on households and communities and connecting to other communities by linking conflict affected areas to markets and promote jobs generation in provincial or municipal government. MAKATI CITY – Following the double-digit expansion in Philippine (PH) export as reported by the Department of Trade and Industry (DTI), the country also sustained its leading position in terms of Purchasing Managers’ Index (PMI) for the manufacturing sector at 53.9, the highest among ASEAN Member States. 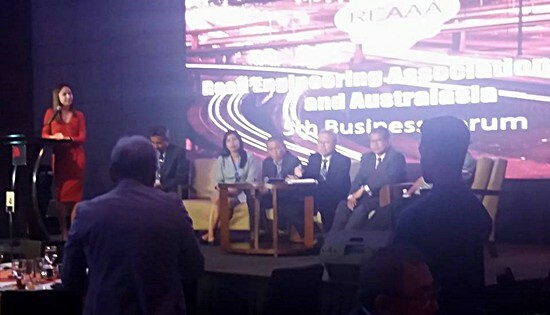 “The 14% expansion in export was on the back of a robust PMI for manufacturing at 53.9, the highest among ASEAN countries,” said DTI Secretary Ramon Lopez, who also serves as chair of the ASEAN Economic Ministers’ (AEM) Meetings. Vietnam’s PMI is at 52.5, Thailand at 50.4, Singapore at 50.3, Indonesia at 49.5, Myanmar at 49.4 and Malaysia at 46.9. “The PMI is an indicator of the manufacturing sector’s health, with indices above 50 signaling improvement in business conditions while those below 50 show deterioration,” explained Sec. Lopez. “This favorable PMI is driven by robust domestic consumption and resurgent exports,” he added. DTI earlier reported that PH exports withstood a slowdown in external demand in June and finished a strong first semester performance, ensuring that exports are both resilient and diversified in terms of products and markets. Total merchandise exports for the period January to June 2017 stood at USD 31.04 billion, expanding by 14% over the USD 27.33 billion posted during the same period in 2016. Said expansion was mainly due to high growth rates of exports to newly revived markets of the People’s Republic of China (including Hongkong SAR), as well as the European Union (EU), which gives the Philippines a Generalized Scheme of Preference Plus (GSP+) status, wherein more than 6,000 product lines enjoy duty free entry into the EU market. Meanwhile, the depreciation of the peso against a backdrop of low inflation rate has also made PH export products more competitive in prices, thus contributing favorably to this surge in exports, according to DTI. DTI continues to implement programs and projects to sustain robust exports growth. A centerpiece program is the revitalization of the manufacturing industry through the Manufacturing Resurgence Program (MRP) and, in partnership with the private sector, the crafting of currently 36 industry roadmaps geared to enhance the capacity and productivity of domestic industries to produce high value added commodities for both domestic and export markets. “We remain committed to easing the cost of doing business in the country. We have been collaborating with other government agencies and the private sector in initiatives that will simplify doing business,” the trade chief said. DTI’s presence can be felt nationwide through 17 Regional Offices that are ready to assist exporters all over the country, to facilitate a conducive environment for businesses and to ensure provision of technical assistance and the needed shared service facilities. DTI is also assisting exporters with enhanced market intelligence through its 27 international posts. NAVAL, Biliran – DPWH-Biliran DEO Civil Engineers attended the 2017 Road Engineering Association of the Philippines (REAP) national convention held on July 19-21, 2017 at Marriott Grand Ballroom, Pasay City, Manila with the Theme: “Innovative Technologies For Safer Roads”. Biliran DEO delegation was headed by District Engineer David P. Adongay, Jr., together with Engr. Rosario B. Rosete -Planning & Design Section Chief, Engr. Dydina G. Velarde, Engr. Supremo Victor D. Sabitsana, Engr. Diolito S. Aberion, Engr. Jeorge S. Malaque and Engr. Mark John G. Morillo. The said convention was also participated by all road construction engineers nationwide. 2017 REAP gathering was started by a golf tournament at Villamor Golf Club, Villamor Air Base, Pasay City, followed by 12th Young Engineers Professional Meeting in the afternoon and a welcome dinner at Marriott Grand Ballroom A. The formal opening of the REAP Convention happened on the second day by Engr. Willy T. Go, REAP National 1st Vice-President & Convention Chairman, acknowledgement of guests and participants, welcome remarks by the representative of Pasay City Mayor Antonino Calixto, and the opening remarks of Engr. Romeo S. Momo - REAP, National President. DPWH Secretary Mark Villar, the Guest of Honor, expressed his gratitude to the dedication and contribution of road engineers in the realization of national development objectives of this administration in lined with the mission and vision of the department. Technical session was conducted on the second day of the event. Relevant topics were discussed which is timely significant in the construction of modern road infrastructures. The first technical speaker was Engr. Medmier G. Malig, Director, DPWH-Bureau of Quality and Safety. She tackled the Road Safety Innovations of the DPWH by presenting the current state of Road Safety in terms of Population, Road Traffic Deaths & Registered Motorized Vehicles by Country Income Status and in the Philippines in present setting, and the DPWH Road Safety strategy in order to provide a safer road infrastructures. Dr. Yutaka Nakamura, from the Institute of Technology, Shimizu Corporation discussed the “Recent Earthquake-Proof Building Design in Japan”. He shared vibrant technologies and innovation in order to come up with a more earthquake resilient infrastructures such as bridges and high-rise buildings. He presented the recent earthquake proof building designs in Japan in terms of Earthquake Risks, Seismic Isolation Method, and Response Control Method and the creation of Business Continuity Plan that will help ensure that business processes can continue during a time of emergency or disaster. Dr. Takashi Kawata - Director, Civil Engineering Technology Division, Shimizu Corporation shared the Japanese Tunneling Technology by discussing the Current status of road tunnels in Japan, rough benefit estimation for tunnel construction, and the different tunnels constructed by Shimizu Corporation in Japan and to other countries in Asia. Mr. Albert K.L. Lim also tackled “Geo Tube Containment Dyke for Coastal Highway Land Reclamation & Flood Control Mitigation”. He discussed the different construction of flood control and dams using geotextile technology. Mr. Dennis Alexander Gross also presented various technology innovations in the construction of slope protection structures. Mr. Raymond A. Eugenio discussed “Polyvinyl Chloride (PVC) Sheet Piling”. He explained the objectives of Pietrucha Manufacturing Philippines Inc. (PMPI), Parameters of PVC Profile GW 458/10.4 vs. Type II Steel Sheet Pile (SSP), Product Applications and Advantages, Installation Methodology and the completed projects using PVC sheet piles. A fellowship dinner ended the second day roll of activities. A Business Forum was conducted on the last day at the same time the REAP National Election of Officers & Directors for CY 2017-2019 was held on another Hall of the venue. The convention was ended right after the 5TH REAAA Business Forum. 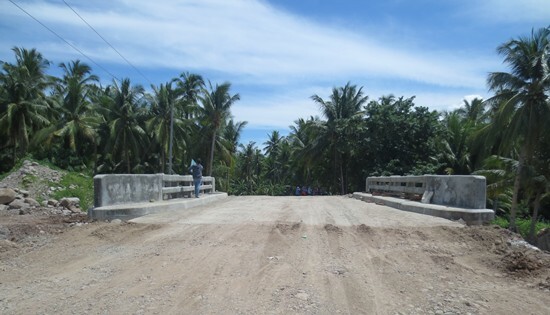 NAVAL, Biliran – The Department of Public Works and Highways-Biliran District Engineering Office reports 100% completion of the P8.7M Replacement of Banlas Bridge (B00061BR) along Maripipi Circumferential Road under FY 2016. According to Engr. Alberto V. Cañete, Project Engineer, the Replacement of Banlas Bridge was target to be completed on August 18, 2016 but was extended due to several changes in the variation order and request time extension from the contractor. “The Banlas Bridge was delayed because the contractor finds difficulty in transporting construction materials to the project site,” said Cañete. The Municipality of Maripipi, is an island separated to the mainland of Naval, the capital town of the province and can only be reached through a small boat with an estimated time travel of one hour and thirty minutes to two hours from Naval. Cañete revealed that the project was completed on July 30, 2017 under contract with LEDA Construction Inc. The existing Banlas Bridge is a concrete Bridge with a length of 5.70 meters and a width of 4.0 meters which fall short of the National standards, hence it was proposed with replacement. The newly completed bridge is a Reinforced Concrete Deck Girder (RCDG) bridge with a width of 8.70 meters and a length of 9.0 meters located along Maripipi Circumferential Road. The completed bridge will provide a standard Bridge (with two lanes) in replacement of the old one which is sub-standard (with one lane only) thereby providing safe passage to the travelling public. It will benefit more or less 6,000 residents of the Municipality of Maripipi. 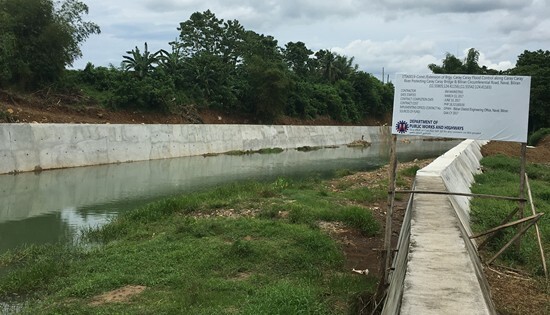 Newly completed Construction of Flood Control along Caray-caray River Protecting Caray-caray Bridge and Biliran Circumferential Road, Naval, Biliran. The project was completed on July 10, 2017 with a contract cost of P20M under BM Marketing. The project was prioritized because of its necessity to mitigate flooding along Caraycaray River and to minimize flood related casualties and damage to properties crops and surrounding environment. NAVAL, Biliran – The Department of Public Works and Highways (DPWH) - Biliran District Engineering Office (BDEO) has completed 36 out of 57 lined-up projects under FY 2017 with a total allotment budget of P940.730M. Engr. Salvador G. Regis,Jr. , Chief of Construction Section said that they are fast-tracking the completion of 18 on-going projects to attain the target date of completion of each projects. Biliran DEO’s FY 2017 Infra Program consists of twenty (20) projects under the National Road Network Services; five (5) under the Flood Management Services, one (1) project under the Maintenance and Construction Services of other Infrastructure; and thirty-one (31) projects under the Local Infrastructure Program with a total of 57 projects based on GAA. As of July 31, 2017, DPWH-BDEO posts 35.30% with only three projects Not-Yet-Started (NYS). According to Engr. Regis these NYS projects have just bid out and undergoing post qualification while one is for revision and approval under the District Engineer’s authority. BDEO’s major projects for 2017 includes the P128.667M Concrete/ Reconstruction of Maripipi Circumferential Road, P61M Slope protection project along Naval-Caibiran Cross Country Road, and P54.939M Rehabilitation including drainage and Right-Of-Way(ROW) Acquisition of Access Road Leading to Naval Port, Naval, Biliran. Another major project prioritized for FY 2017 is the road widening including drainage of Biliran Circumferential Road of road sections in Brgy. Tucdao, Kawayan, Brgy. Virginia, Culaba, Brgy. Bool, Culaba, Sto.Riverside to Sto. Sagrada, Naval, Brgy. Burabod, Biliran and Brgy. BalaquidCabucgayan, Biliran costing P172.192M with total length of 5.940km and another P125.588M road widening project of road sections in Brgy. Lumbia, Biliran, Brgy. Burabod, Kawayan, Brgy. Mapuyo, Kawayan, Brgy.Tucdao, Kawayan, and Brgy. Kaulangohan,Caibiran, Biliran with a total length of 4.281km. Engr. Regis said that the P172.192M and P125.588M widening project along BCR have just started in the month of July and now being closely monitored along with other on-going projects. The big amount projects were started late due to late approval of the “request to bid and implement” at the Central Office, Manila. WASHINGTON, DC – Finalists for the 2017 Online Journalism Awards, representing a wide range of nonprofit, public, academic, major media and emerging technology organizations from around the globe, were announced today by the Online News Association. A special selection committee also granted the James Foley Award for Conflict Reporting to photojournalist and multimedia producer Tara Todras-Whitehill. She is the third recipient of the award, which honors journalists reporting under the most challenging conditions. Todras-Whitehill has been documenting stories of vulnerable populations – especially women and refugees – in the Middle East region for over a decade. Judges were recused from discussing categories in which their own organizations were entered.